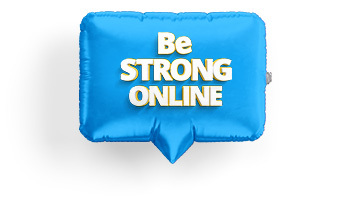 Alongside running your Be Strong Online sessions on the ten modules, a key part of your role as Be Strong Online Ambassadors is to work as a team to create an awareness-raising campaign in your school. During the training days you came up with excellent ideas to raise awareness about the programme: from posters, noticeboards and assemblies to parent information sessions, podcasts and even plays, your Be Strong Online campaign can have a huge impact in promoting online safety skills in your school. But how can you get the word out about all of this amazing work? One great way to do this is to harness the power of social media. When it comes to raising awareness about the Be Strong Online Ambassadors Programme in your school, it’s important to be visible where the students in your school spend a large amount of their time – online. Using social media can help highlight to the wider community, including students, staff and parents, what Be Strong Online is all about and promote your activities to the school community. Sharnbrook Upper School in Bedford used Facebook Pages to promote their anti-bullying work and let students know who they could turn to if they were having a problem with bullying. Why not use a social media page to introduce your Be Strong Online Ambassador team to the rest of the school? Newbridge College in Ireland use social media to promote their dedicated team email address and share ways that students could get help during the school holidays. You could create a jpeg of Be Strong Online advice to share online when students are away from school. YouTube is a great way to share news and updates about the work your Be Strong Online Ambassadors team has been doing. The first step is to speak to your team and staff leader to discuss pushing out your Be Strong Online work on social media. Your school might already have a Twitter account or Facebook Page which your staff member would prefer to use, or you can set up a dedicated Be Strong Online social media account for your school. Decide with your team who will be in charge of managing the social media channels and creating content. It’s also worth setting out a code of conduct for students managing the social media channels and audience. Make sure you keep your content fresh and post regularly: you could take online safety tips or key messages from the module documents, positive messages about staying safe online, links to the information sheets or pictures from your Be Strong Online campaign. Use videos and images to attract interest from your audience. You could create jpegs, take videos of your team sharing their top tips to be strong online, or share relevant information about how students can find out more about your campaign. Finally, it’s really important to speak to the staff member in charge of safeguarding at your school about what you need to do to make sure students and staff stay safe.